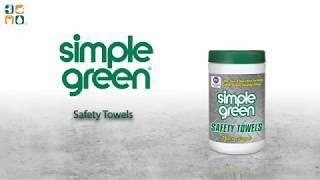 Simple Green Safety Towels offer a quick, easy, safe and effective way to clean grease, oil, tar, soot and much more from most surfaces. These VOC compliant. lint-free polypropylene towels are premoistened with nontoxic, biodegradable Crystal Simple Green formula for extra cleaning power. These multipurpose, dual-textured towels feature an abrasive side for tough scrubbing, plus a softer side for fine cleaning. Safe for use on skin. Each environmentally conscious towel is 10" x 12" in sheet size.